Who is Warren, what does it all have to do with suicide and what does it mean to continuously re-invent and find oneself? Berlin’s Punk artist duo Cherie (Vocals & Visuals) and Nackt (Vocals & Sound) experience Warren every day – they can answer these questions, they are his organ. Warren Suicide were founded as an Electro Trio in Berlin in 2003. Nackt and then band member Fremdkörper were looking for a sound, a character while Cherie was drawing a strange figure on a piece of paper in front of her. Warren appears with the words “Hello, hello, my name is Warren Suicide”. It’s a small face, the outlines slightly contorted, a slender figure, asexual, thin arms and legs. It smiled carefully, the teeth looking like those of a fish, the eyes with the look of a new-born baby, but wide open. Ever since then, life, music, art and Warren have existed alongside each other and the anarchistic comic character has been their spiritual guru ever since, an essence which motivates the band – Warren Suicide lies somewhere between the imaginable and the apprehended. During the first album production, founder member Fremdkörper disappears but Cherie and Nackt were pushed further by Warren until the first album “The Hello” gets an April 2006 release on Fume Records in England. “It’s as though Fremdkörper turned into Warren”, says Nackt “when you listen to the first album, you discover his life story”. 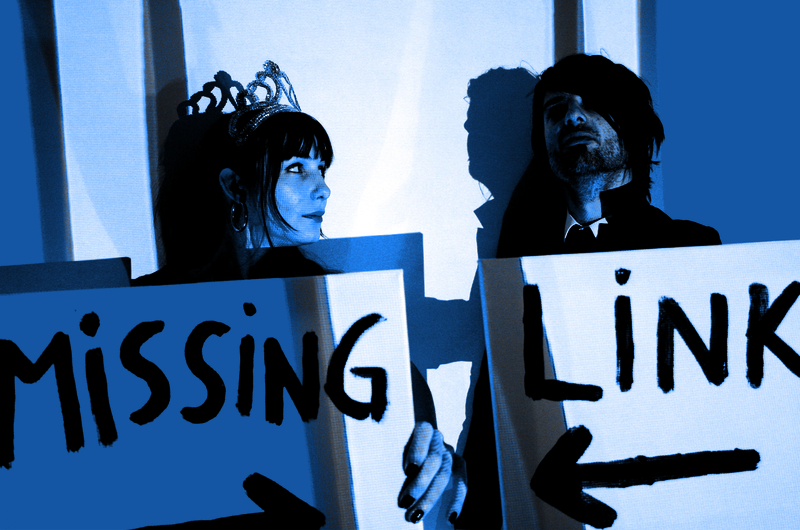 The second album “Requiem For A Missing Link” which was released on Shitkatapult on 6th June 2008 is like a reincarnation, it’s an end, a beginning, a journey, love and hate, a home, responsibility, freedom, an inspiration and destiny. Twelve songs that melt into the composition of different genres. “Run Run”, “Land Of The Free” and “Home” as master pieces of strange Pop music. Electronic Music, Rock and Dada mix with string arrangements, distorted bass sounds, drum loops and the complementary voices of Cherie and Nackt. In addition to this, you will find that Cherie’s paintings are a mirror that explains everything you need to know about Warren’s world. What Warren Suicide represents is starting to have an effect on other areas as well – for example on the soundtrack of Wim Wender’s “Land of Plenty”. Excessive parties: “Signal 1” at Berlin Kreuzberg’s ballroom where more than 100 international artists and musicians united and let off steam for 4 days under the Warren Suicide motto “We Got A Signal”. In exhibitions of Cheries artwork and paintings. In Nackt’s compositions for theatre plays “Das trunkene Schiff”, “Die Leiden des jungen Werther”, both Frankfurt theatre). At Munich’s Prinzregententheater at the ballet staging of Becketts “Godot”. Sometimes even in the background, for example the playstation games “Gran Tourismo” and “Driver”, as well as MTV’s “Real World” and “Making The Video”. On tours, support shows (amongst others for the B52’s), festivals in Europe and the USA as well as with radio concerts on BBC (UK) or Motor FM (Germany), they managed to create enthusiastic confusion with their ecstatic music. Besides their live presence, Warren Suicide were asked to remix tracks by artists such as Placebo, Dub Pistols, Die Happy, Gods Of Blitz or Duné. Warren Suicide have brought to life a unique festival series called Signal – The Berlin String Theory with “party arty Diktator” Yaneq (p-pack) and Ben Lauber (Transporterraum). This is an art and music project which has brought together a large number of bands and artists such as Pitchtuner, Paula, Tocotronic, Quarks, Gina D´orio vs Soffie O., Kante or Gods Of Blitz, to name but a few who re-recorded their own songs with a string quartet at the ChezCherie, the Warren Suicide studio. The paintings which were created by Berlin’s Party Arty painter and the album recorded by all artists who took part were released for “The Berlin String Theory” New Year’s concert 2008 at Berlin’s Volksbühne. Live, Cherie and Nackt perform with allied musicians, any additional band member is a variable which turns each show into a unique event of its own. During the forthcoming concerts, former band members such as Earl Harvin (from “The The” / “Air”) and Ghost & Nader from the band “Officer I’m High” will extend the Warren cosmos with their own energy. Warren Suicide: they are unpredictable – thrown into life by people who step out of a drawing on paper, onto the stage, into the world where Warren reaches the most remote parts of the world – he still isn’t pretty – that’s what you get when your name reflects what you are and what you can become, every single day we voluntarily die a bit more. Warren Suicide however is the power that nourishes you because he is not afraid of anything in this world. Not of unfinished sentences – or even life itself!